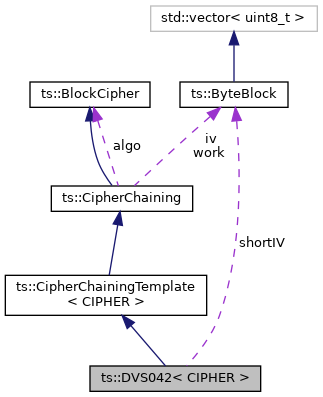 Current initialization vector for short blocks. 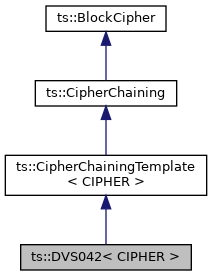 DVS 042 cipher block chaining mode. The only noticeable difference between the two versions is the handling of messages shorter than the block size. In the 2003 (DVS 042) version, the same IV (called "whitener" in the standard) is used for long and short messages. In the 2008 version, a different "whitener2" must be used for messages shorter than the block size. The ATIS-0800006 standard (IDSA) uses the same chaining mode and residue processing as DVS-042 but is based on AES instead of DES. Set a new initialization vector for short blocks. The method setIV() sets the IV for long blocks (longer than the block size) and short blocks (shorter than the block size). The latter can then be overwritten using setShortIV(). Reimplemented in ts::SCTE52_2008, ts::SCTE52_2003, and ts::IDSA.